Equipment: Backpack, Thieves Tools, Sneak Shoes, Belt Pouch, 4 Oil Flasks, 10 pcs Chalk, Climbing Boots, Climbing Gloves, Silent Quiver, Dagger Bandoleer, 7 Daggers (2silvered), 2 Pot Greek Fire, Jar of Spider Poison, MC Silver Arrows(18), Arrows(20), Holy Symbol of Eilistraee, pair of jeweled gloves, jeweled and Silver headdress. Magical Items: Ring of Eilistraee*, Candle of Invocation, 3 Pot Cure Light, 1 Pot Cure Mod, 1 Pot Cure Serious, 1Pot Bull Str, Gloves of Dex+2, Ring of Life Detection@, Scroll Tube of Communication#, Bag of Holding (loan from Tareth Grainael), 3 Scrolls (1st:Cure Light, Mage Armor) (2nd:Magic Fang, Detect Chaos)(3rd:Dispel Magic, Heat Metal), Necklace of Prayer Beads (-Bless -Bless -Karma), Amulet of Natural Armor+3, +3Elven Blade, +1Elven Sword, Cloak of Resistance, Book of Leadership, Ioun Stone (P&GSphere +2Chr), Ring of Invisibility. Languages: Undercommon, Drow, Silent Tounge, Elven, Orc, Draconic, Merchant Tongue. 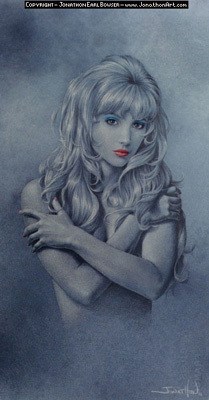 Description: Talindra is an exquisite example of a young Drow elf. She suffers from severe Albinism, making her pallor sort of a light silvery grey, which is heightened by her stark white hair. Her eyes are a light violet and she weighs in at only 82 pounds. She looks both childlike (age 46) for an elf, and very mature at the same time. She typically acts very reserved, as if her beauty makes her very uncomfortable. History and Personality: Talindra was raised by the temple of an undisclosed Underdark city. (She does not like to discuss her past, and gives few details of her life to all but the closest friends). Having been born into such an obvious weakness (albinism), she was cast out from Drow society, to be adopted by this temple as she was obviously marked by the gods. She was eventually exiled from that city for stealing from the Temple that raised her. As part of her punishment her Right Thumb was severed from her hand after a powerful Cleric cursed her that no wound caused by a Drow would ever heal. Somehow she made it to the surface world and was adopted by a kind family of Elves (of the moonbow clan) and nursed back to health. So generous was this family that they even paid a Dwarven smith to craft a working "replacement" thumb for Talindra from steel and brass. Eventually her new family released her from her life debt to them and sent her out into the world. She currently leads a small, but exceptionally loyal, group of mercenaries about the continent looking for glory and riches. In this group, named the Moondown Company, Talindra has formed bonds of friendship and trust that she had not previously known were possible. 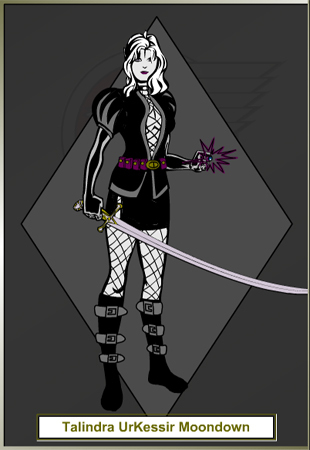 The core group of this company primarily consists of Talindra "Sarge", Alyssa Stormweaver, and an Elven Noble Mage Uli. Each of these three hold a quiet secret trust in each other, a trust that has proved more powerful than any adversary they have yet to face.